in which, once again, we see the two components of energy consumption, the production-related component (1.9929 MMBtu/lb.) and the production-unrelated base load (65,546 MMBtu). In each of these examples, the R2 value indicates the level of confidence we have in the fit of the regression line to the scatter of points. 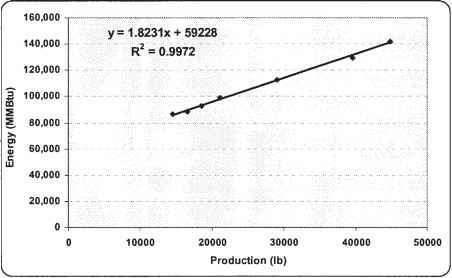 In the industrial example, it is important to note that many points lie above and below the regression line. This may indicate that energy performance has changed at some point within the 27 months considered. If the points were plotted chronologically, it might become evident that the early points fall above the line (i.e. 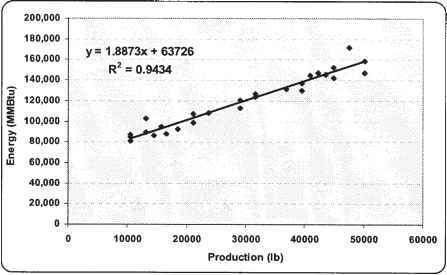 at relatively higher energy consumption for given production levels) while later points fall below the line (i.e. at relatively lower energy consumption), or vice versa. 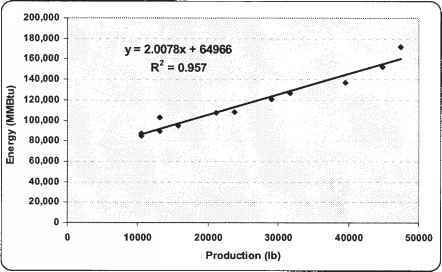 If there has been a change in performance, either due to a deliberate action or for an as yet unknown reason, the regression model for the entire data set is not a useful basis for comparison; that is, we need a "baseline" period that is characterized by consistent performance or efficiency. Finding a baseline period may involve trial and error analysis of the data, or it may be defined as a result of knowledge about plant operations. 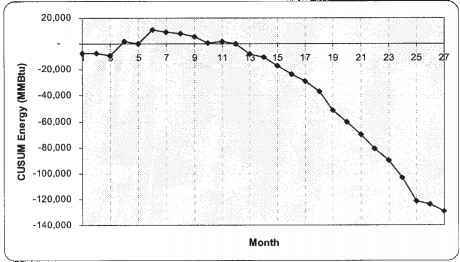 For the purposes of this illustration, let us suppose that it is known that the plant performed consistently for the first 12 months, at which point an improvement was implemented. The regression of the first 12 points in the data set yields Figure 1-19 and a new energy performance model for the baseline period. Both of these findings suggest that performance improvements have taken place to lower the overall energy consumption rates from what they were in the first year. The baseline EPM, for the shaded months in Table 1-8, is used in CUSUM analysis. 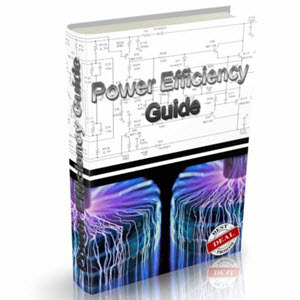 • Predicted values of energy consumption are calculated from Equation 1-8 the actual production values. • Variance is simply actual consumption-predicted consumption. • CUSUM values are, as the name indicates, the cumulative algebraic sum of the variances. = 5,389 (the cumulative sum for the previous month) + (-4,621) (the variance for Oct 02). The CUSUM values are plotted in a time series shown in Figure 1-20. The CUSUM graph reveals changes in energy performance at any point where there is a significant change in the slope of the line. A downward trending line indicates energy saved in comparison to the baseline performance, while an upward trending line indicates a higher rate of consumption. After the first 12 months of the data set, a downward trend that continues until approximately month 18 is noted. At that point, the downward trend increases in rate, indicating that energy is being saved at a higher rate than in the previous 6 months; this trend continues until month 25. At month 25, another change in slope is observed, but this time to a lower rate of saving; this change indicates that one of the improvements, probably the second one, has stopped functioning, and that action is required to correct the malfunction. Comparison of the slopes for line segments 12-18 and 25-27 indicates that they appear to be approximately the same; that is, the rate of savings is the same in these two periods. MMBtu (actually 128,884 MMBtu from Table 1-8) has been saved in comparison to what would have been consumed had the baseline performance continued for the entire period. 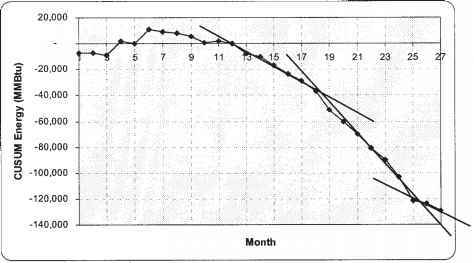 The CUSUM graph indicates when performance changes occurred, and what they achieved in terms of energy saved or wasted. It does not directly indicate how or why those changes occurred. However, further examination of the period of best performance, months 18 through 24 in the example, does give some further information. Figure 1-22 is the regression line for those months. The improvement in the production-related consumption is 9.20%, while the production-unrelated baseload has been reduced by 8.83%. That is, there has been an improvement in operating efficiency as well as a reduction in baseload waste.